The South Fraser Blog: September 24, 2018 Council Meeting Notes: A public hearing, enhancing the walking network, and community updates. September 24, 2018 Council Meeting Notes: A public hearing, enhancing the walking network, and community updates. 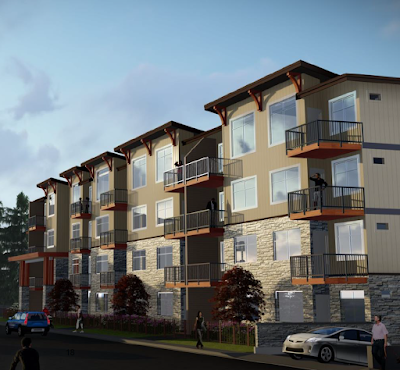 Last night, a public hearing was held for a proposed 4-storey, 127-unit apartment building along Brydon Crescent. Render of proposed apartment located at 5423, 5433, 19900, 19910, 19920, and 19930 Brydon Crescent. Select image to enlarge. One of the key features of this development proposal —as I posted about previously— is a pedestrian right-of-way that will extended from Brydon Crescent, over Baldi Creek, to the trail network via an 8 metre wide fire lane on the east side of the proposed apartment. If approved, this will close a gap in the walking network in this section of our community. Some of the other features of the proposal include an at-level first floor which will keep eyes and ears on the street. The apartment is also proposed to have an enhanced setback from Baldi Creek (beyond what the City requires) which will result in more eco-system being preserved. The project proposal also includes ground-level lighting to help reduce light pollution while still ensuring that the area is well lit. There was one person who was concerned that there wasn’t enough visitor parking at the public hearing. The resident was told that the development will include 26 visitor stalls. As a note, Langley City requires more parking per apartment unit than other municipalities in the Fraser Valley. After the public hearing, council heard from the Langley Human Dignity Coalition. The coalition’s mandate is to “promote, protect and advance the principles of human dignity, equality and inclusion in the community.” Langley City along with Langley Community Services Society and the provincial government provide support for the coalition. Dr. Julie Clayton requested that council consider appointing a permanent City representative to the coalition as well as provide access to meeting space. Council directed the organization to connect with City staff to get the ball rolling. A presentation from the Langley Environment Partner Society. Select image to enlarge. Council also heard from the Langley Environment Partner Society about their annual Summer Youth Employment Project which is funded by the City. The program has three major goals: habitat enhancement, environmental education, and employability skills for participants which include both high school and college students. This summer, they removed invasive plants from 3 sites for a total of 1160 square metres. They also removed 75 pounds of garbage. The team attended 6 community events. Council gave final reading to bylaws which would discharge two land use contracts which I posted about last week. Council also gave final reading to an updated fees and charges bylaw which I also previously posted about. Council approved Darrin Leite who is the Director of Corporate Services to attend the Chartered Professional Accountants Public Sector Conference in Ottawa from October 22 to 24. Last week, a resident asked me about subsidized recreation passes for youth who have limited financial means. Last night, I asked Kim Hilton who is the Director of Recreation, Culture and Community Services about what options are available. She noted that annual youth passes are normally $10, but that through the Leisure Access Program, they can be subsidized for people based on need.